This sermon, offered by The Rev. 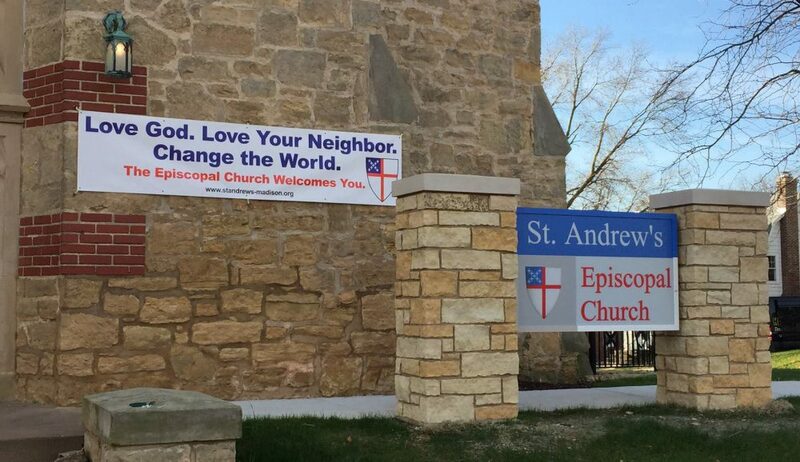 Andy Jones at Saint Andrew’s Episcopal Church in Madison, Wisconsin on July 29, 2018, is built around the readings for Proper 12B in the Revised Common Lectionary. It was clearly a disaster. There they were on the other side of the Sea of Galilee, in Gentile territory, on the side of a mountain and 5000 people had followed them; people who had come seeking the freedom and the joy that Jesus had to offer; wanting some part of the dream, the vision, of God that he was proclaiming. And there, in the area in that desert place, there was nothing to eat. The disciples knew it. They were clearly nervous. Philip had already done the math and figured out how much it would cost to feed all of these people, and knew that was beyond their means. And Andrew had gone scouting the resources and discovered that there was nothing but five barley loaves and two dried fish; the traveling fare of poor people on the road. And yet in the midst of this disaster Jesus looks at Philip and says, “Where are we going to buy food for all of these people?” Implicit in that question was a charge. You need to take care of my sheep. So, Philip, and Andrew, and the rest of the disciples must have been panic stricken. Here was their teacher, their master, their friend, asking them to take care of this hoard of people. And they couldn’t believe that the meager supply of food they had with them could be enough. I don’t know about you but the more I read the story, and the more I live in these words, the more I recognize myself standing in front of the television in the evening and watching the news, while I struggled to make dinner. It’s hard to imagine how any of us can muster the resources, or have what we need, to take care of the world around us when so much seems to be going wrong, when the news is so bad, when the cards seem to be stacked against us so deeply. And yet this morning Jesus is calling out to us, just like he did to John’s community, and just like he did to his disciples there on that mountainside near the Sea of Galilee, to care for his sheep. But how? How can any one of us make a difference? The danger in this moment, I think, is that we will despair. And you can hear a little bit of that, I think, in Philip and Andrew’s words. and while it doesn’t get said in this gospel in other tellings of this story it is made explicit. “We can’t do anything to help these people send them away and let them take care of themselves.” The despair, the paralysis, the move towards absolving ourselves of responsibility, is a clear danger when we are confronted by such devastating need and don’t feel like we have enough to make a difference. That’s why this story this morning is so important. All four evangelists tell us this story. Somehow, somehow, there in that place, five barley loaves and a couple of fish were enough to satisfy five thousand people. Now we can knot ourselves up wondering whether Jesus subverted the laws of nature and multiplied the physical food, or whether this act of generosity and vulnerability opened people’s hearts in a way that led them to share what they had with them… But that’s really not the point of this story. The point is that this simple gift offered in vulnerability in God’s name to these people was enough. Somehow through God this meager gift was enough. In the Episcopal Church all seminarians have to take a series of classes or do an internship called Clinical Pastoral Education. this is the moment where we learn to be fully present to people in their pain and to listen to what they are saying without bringing to that moment our own history, our own concerns, our own fears and anxieties. I was a chaplain at a retirement community in Gaithersburg, Maryland that offered the full range of care, from high-rise independent living to full-blown nursing and Alzheimer’s care. And we would go and interact with the patients and the residents there and then sit in a group and talk about the ways that we had interacted; talk about what had frightened us; talk about how we had managed to give what we had, or how we had held back. All summer long our lead supervisor drummed this mantra into our heads, “You are enough.” Again and again he told us that his task that summer wasn’t to fill our toolboxes with techniques and clever things to say; ways to survive moments of pain in other people’s presence. He told us again and again that his main concern was convincing us that if we were willing to give what we had to offer, and just be present with someone, that that was more than enough. The gift of being calm, and present, and listening to another’s pain can be life changing and life-giving; both to the person who’s hurting and the person who is offering themself. “You are enough! We are enough!” that’s why this story, I think, is so important. When we offer ourselves and our gifts in this way it’s common to not be present when those gifts bear fruit. Sometimes those seeds we plant, sometimes those gifts we offer, don’t produce results, don’t bear fruit, don’t change things, until after we have left, and we don’t get to see it happen. And so, it’s not uncommon for us to believe that we haven’t really done anything at all. And in the face of overwhelming pain and difficulty, like the world that we are experiencing now, we are in danger of retreating holding ourselves back, and not offering anything at all. The point of this story today is that we are enough, and you are enough, and small acts of kindness, of compassion, of generosity; standing up for justice even in small things can make a difference. And those meager gifts, when offered in God’s name, will be multiplied from generation to generation, from person to person, from community to community. And just like that gift of five loaves of bread and a couple of fish, just like the gifts that John’s community were offering after the temple had been destroyed in Jerusalem, and just like the gifts offered by generations of people preceding us, those gifts can make a difference. And just might change the world. We are called to give what we have. Sometimes it may feel futile. Sometimes it may seem like there’s nothing we can do and this little bit that we’ve offered hasn’t changed a thing. But this story reminds us to have faith, and to have hope, and to know that we are not doing this alone, and that God is with us. And God will multiply those gifts. You and I, working through God, might just change the world. Now to him who by the power at work within us is able to accomplish abundantly far more than all we can ask or imagine to him be glory in the church and in Christ Jesus to all generations forever and ever. Amen (Ephesians 3:20,21).